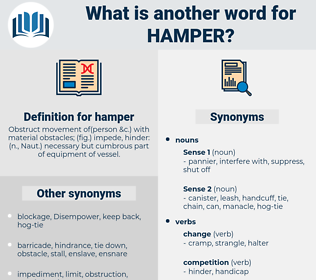 What is another word for hamper? Obstruct movement of( person &c.) with material obstacles; ( fig.) impede, hinder: ( n., Naut.) necessary but cumbrous part of equipment of vessel. undermined, Prevented, Interfered, affected, reduced, Challenged, blocked, Stood. jeopardize, undermine, frustrate, prevent, complicate, preclude, thwart, interfere, jeopardise, endanger, discourage, affect, deter, block, embarrass, disturb, curtail, stifle, diminish, pre-empt, restrain, threaten, dampen, curb, detract, negate, stop, erode, prejudice, impinge, weaken, handicap, retard, damage, halt, compromise, limit, bother, infringe, interrupt, distort, imperil, stall, fetter, reduce, hurt, delay, slow, forestall, stunt, prejudge, prohibit, suppress, alter, destabilize, mitigate, decelerate, deprive. harm, disrupt, derail, hobble, stymie, cripple, hindrance, aggravate, injure. assist, encourage, untie, unfasten, aid, help, abet, promote, further, forward, loose, liberate, free, permit, advance, facilitate, allow, expedite, support, benefit, let go, open, explain, release, loosen, push. I mean," Maud hurried to say, " I hope she will not hamper us with it on our tour. At least she would be able to begin her life again without his burden to hamper her. 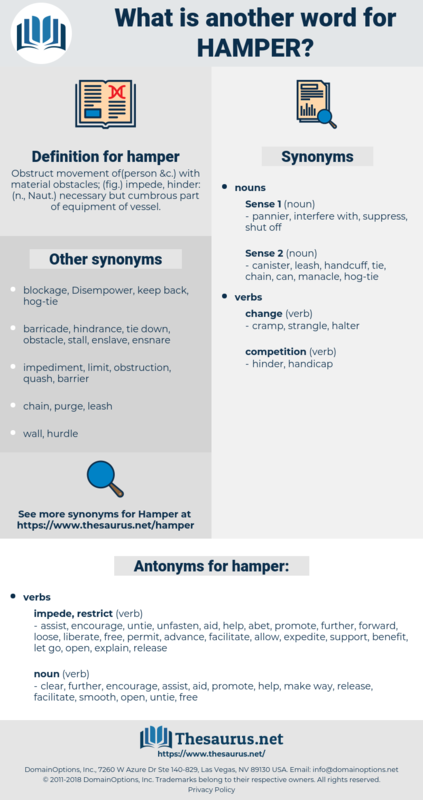 clothes basket, food hamper, clothes hamper, chains, ball and chain, irons, handcuff, handlock, laundry basket, cuff, manacle, hobble, voider, fetter. confine, trammel, throttle, limit, bound, restrict.